We are so excited to feature this seriously romantic Central Park proposal. 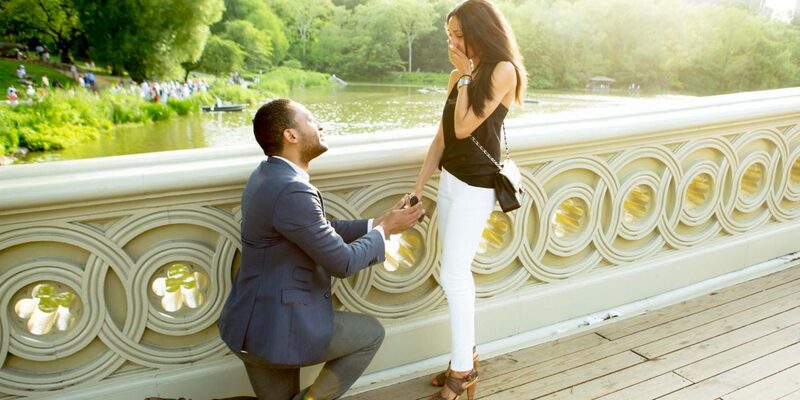 Chris planned a sweet Central Park proposal for his second anniversary with Michelle. Read on to see how he pulled it off. “In honour of our second anniversary, Chris suggested we celebrate with dinner at the Central Park Boathouse. Despite living in the city for four years, he had never been to Central Park so when he suggested a walk through the park before hand, I didn’t think twice. “We arrived at the restaurant early, so we decided to visit Bethesda Fountain and the iconic Bow Bridge. Once we reached the midpoint on the bridge, he stopped me so we could watch the paddle boats and gondolas float beneath us while the sun set behind the city skyline. “At that moment he bent to one knee, took my hands, and recited a poem he had previously given to me at Christmas along with a promise ring. He told me today was the day he would make good on that promise. Then, on bended knee, he asked me to marry him!